What I should do is make an argument about the Ubu plays. I should interpret them. I have read two different versions of the three plays, plus an additional volume of Jarry’s writing, plus a certain amount of background reading on Alfred Jarry and his world. I should be brimming with interpretive fervor. At first, before reading Ubu Roi, and maybe even after, I had thought that Jarry was a particularly imaginative and forceful example of the French bourgeoisie shocker. Not that these creatures do not exist, but I should have learned my lesson by now. Charles Baudelaire, Gustave Flaubert, Arthur Rimbaud – like Alfred Jarry, these writers could not have cared less about the so-called bourgeoisie, or they quickly found more interesting things to do with their talents, or both. I do believe that Jarry was interested in shock, but his target was the avant garde, French Bohemia. He wanted to shake up, or provoke, or perhaps merely amuse, his own world, his own friends, his own audience of painters and poets and theatrical thrill-seekers and weirdos. He succeeded, I think; he stands right at the head of the explosion of conceptual art that was about to wash over Paris and the new century. Whether his work was really at all a cause of the conceptual revolution, providing useful models or ideas, or merely a colorful early example of the rapidly changing, formally inventive art and anti-art created soon after by Stravinsky, Picasso, Tzara, and so on, who knows. Apollinaire was openly influenced by Jarry, and Duchamp has to have been, right? Otherwise, I have some doubts. I find it helpful to remind myself that the most openly outrageous Ubu play, the one I find the most shocking, at least, the toilet-obsessed Ubu Cuckolded was neither performed nor published until 1944. PISSWEET: Forward, comrades! Hurrah for freedom!... We are free to do what we want, even to obey. We are free to go anywhere we choose, even to prison! Slavery is the only true freedom! Ubu Enslaved is full of scenes like this, many of them openly structured like gags. So this is the argument I would make if I had the energy to make an argument, that in the Ubu plays, Jarry was deliberately demonstrating different kinds of radical artistic freedom – freedom to be chaotic, freedom to use form, freedom to offend, freedom to reform. That Pa Ubu is not always working to the same purpose as his author shows how far Jarry was willing to push the idea. Père Ubu is a monstrous inversion of Hello Kitty, bibliographing nicole boldly declares, and how can I not agree? The character of Pa Ubu is Alfred Jarry’s greatest creation. If Ubu is not as ubu-iqitous as Don Quixote or Faust or Falstaff, to pick some precedents, characters who escaped their creators, it is because the 20th century avant garde has so ruthlessly cannibalized him. He holds an unmentionable brush in his hand and hurls it at the gathering. PA UBU. Try a taste of that. (Several taste and collapse poisoned.) Now pass me the spare ribs of Polish bison, Mother, and I’ll dish them out. PA UBU. You’re still here? By my green candle, I’ll do you in with bison ribs. He begins to throw them. Then Pa complains that he has “had a lousy meal”! Despite the loudness of his brutality, Pa Ubu frequently reminded me of the silent Harpo Marx. Both characters are agents of chaos. So are Groucho and Chico, but they are restrained by intelligence and stupidity, respectively. Harpo is the one who is not quite human. Harpo is the troll. Rise links Ubu Roi to the dictator novel. As you can see, I read the Ubu plays and think of Duck Soup. Thinking of Idi Amin is too frightening. I suppose if I have been disappointed by Jarry, it is that he created only one great character. Ma Ubu has her moments – she starts strong, for example, as a sort of idiotic Lady Macbeth – but is undefined compared to Pa Ubu. A thoughtful reader might point me to – or, even better, write – a feminist counter to Jarry, Hedda Gabler crossed with Lady Macbeth strained through Brecht’s, or Grimmelshausen’s, Mother Courage. Winnie, in Beckett’s Happy Days, might be a useful reference. All I seem to be able to do is list other works and characters. I only discussed Ubu Roi with you because it has the advantage of being the sort of play that most of the public will appreciate. “Plays are meant to be seen!” How often have I come across some variant of this sentiment, on book blogs or elsewhere, a bromide I uncharitably interpret as “I do not know how to read plays.” But of course, I do see the plays I read, while I read them. I use my imagination. For the reader who wants the assistance, Jarry and others left behind a substantial amount of documentation about the performance of Ubu Roi – the other Ubu plays were not performed during or anywhere near Jarry’s lifetime. The Selected Works of Alfred Jarry (1965), ed. Roger Shattuck, tr. by many hands, is packed with all sorts of wonderful nonsense on the theater. 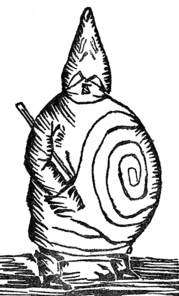 Pa Ubu, for example, really should look like Jarry’s drawing on the left, with the spiral on his enormous belly and the strange, long-nosed mask destroying any ordinary notion of acting. Through much of the play, he should be carrying a toilet brush, and when mounted, he wears a cardboard horse head. And it is better for them not to move, and that the whole play should be spoken in a monotone. The imagined voice is crucial, and the delivery. Ubu Roi is a comedy, I guess. Some readings are funnier than others. So I read lines aloud, try out different registers. I have convinced myself that Jarry’s advice is not quite right – the nightmarish Pa and Ma Ubu should certainly bellow their idiotic lines, like George Costanza’s parents on Seinfeld, the couple that knows each other so well they simply skip to the screaming at the first hint of conflict – more efficient, don’t you know. But the effect is funnier if other characters act as if they are in a Shakespeare or Racine play or, I don’t know, Long Day’s Journey into Night, as if they are method actors squeezing every drop of meaning out of their lines. The backdrop at the premiere was painted by Bonnard and Toulouse-Lautrec, among others, and included “a bed, and at the foot of the bed a bare tree and snow falling,” as well as palm trees and a dangling skeleton. Scene changes were signified by a sign hung from a nail, the responsibility of “[a] venerable gentleman in evening dress.” All of this from Arthur Symons's description of the first night, pp. 256-7 of Martin Esslin’s The Theatre of the Absurd (1961). None of this is remotely necessary to read Jarry. Let fly. After all, if you “simplify it somewhat… we would have something which could not fail to be funny,” since, Jarry writes, Ubu Roi is “the sort of play that most of the public will appreciate” (Selected Works, 67-8). * Not that Jarry’s special effects are that special. Nothing that, for example, the 18th century Italian stage could not handle. See Carlo Gozzi’s The King Stag (1762), as found in Eric Bentley’s The Servant of Two Masters and Other Italian Classics (1986). Now, what would have happened one hundred and fifteen years ago, at the 1896 première of Alfred Jarry’s Ubu Roi, after this utterance of the play’s first word, is a fifteen minute theater riot. In the context of the pandemonium at the 1830 debut of Victor Hugo’s 1830 Hernani, caused by his violation of French Classical prosody, such as misplacing the caesura in the opening line, or the fooforaw over Stravinsky and Diaghilev’s The Rite of Spring in 1913, I am not convinced that fifteen minutes is particularly long for a French theatrical riot. All of this fuss is adorable. Am I right? Screaming and hooting over a single scatological crumb, a speck of not-quite-profanity, a malformed cousin of “Shoot” and “Sugar” and “Wednesday.”*** I have seen, or perhaps, since I can’t remember any details, only heard about movies where the first ten or twenty words are profane, a gesture that I suppose is meant to shock an audience numbed by Quentin Tarantino and David Mamet. Does it ever actually work? Maybe on television, where I still occasionally feel that jolt – you can say that on broadcast TV now? But on screen or stage, please. So the genuine outrage and horror of century-past French theater-goers – ones who specifically chose to attend an avant garde play – delights me. Only a few years later, Dadaist theaters had to distribute rotten fruit to their patrons, had to demand that they be outraged, had to actively facilitate their anger. Yeats was right - Jarry’s jape had changed the world, just a little bit. MA UBU. Ooh! What a nasty word. Pa Ubu, you’re a dirty old man. McLeish has Ma Ubu simply say “Pa Ubu, language,” which is a better gag for an actual performance, if “better” has any meaning in Ubu-world. What has bibliographing nicole been writing? Oh, she’s going after the first word as well. It’s irresistible, as a part of theater history, too important to ignore. As literature, eh, thin stuff. Nicole presents a passage that suggests there is more to Jarry than shocking the bourgeoisie. Oh, there is, there is. Update: Look at what In Lieu of a Field Guide does with the first word - now that's a good pummeling - and then it just keeps going. * “Pschitt!” as translated by Cyril Connolly and Simon Watson Taylor, and note their unnecessarily punchy exclamation point; “Shikt.” per Kenneth McLeish. Translating Ubu Roi is fun, fun, fun. ** I am pilfering Roger Shattuck’s The Banquet Years (1955), particularly pages 161-4. The quotations from Yeats, and his entire paragraph on the performance, are on p. 163, and can also be found in the second volume of his Autobiography, the 1922 The Trembling of the Veil. Business first. My vacation starts tomorrow; back a week from Monday. Then the nightmare that will be Ubu Week begins. I think bibliographing nicole is joining in around the same time, although she has recently had better things to do. I remind any readalongers that there are no schedules and rules. King Ubu, he’s the one who demands rules and disembrainings, not me. Vacation to do list: 1. Write this post, 2. Go on vacation, 3. Ubu Week. Got it. I have had all sorts of bad ideas that have not made it onto Wuthering Expectations. Also, bad ideas that have, a separate subject. It is possible that some of those bad ideas are actually good ideas, that it is only my thinking that is bad. Here are some nuts I have not yet cracked, or that I do not realize were cracked long ago, by a squirrel, perhaps, with the nut extracted and eaten, while I keep gnawing on the empty shell. 1. Complexity. Why do some good books keep their readers for hundreds of years, and other similarly good books do not? I have this idea that the complexity of the book is crucial. Not difficulty, which may well be a form of complexity. The less complex books are replaced by new versions of the same idea. The more complex books are irreplaceable. I want to push past the idea that innovation is important. We’re living in a period when the taste or preference for innovation is extraordinarily high. I’m looking for something more universal. The more universal the idea, the more reductive, simple, and banal. The more boring. 2. So another idea, a self-serving one, is to defend boring writing. My recent reading of the Javier Marías novel Your Face Tomorrow: Fever and Spear has inspired some (bad) thought on the subject, although I have written about it before. Nothing special about Marías here – he is borrowing from the maniacally precise descriptive writing of Alain Robbe-Grillet and the maddeningly spiralling monologues of Thomas Bernhard. The boredom is conceptually purposeful, a perverse form of tension-building. The challenge here would be to define and defend artful boredom. A recent sparkling and witty Joseph Epstein piece on boredom suggests some helpful books and directions. Epstein notes that Isaac Bashevis Singer argued that boredom is “the natural human condition of men and women,” and that “the purpose of art was to eliminate boredom.” My goal would be to defend art whose purpose is to induce boredom. The problem, obviously, is that my week-long defense of boring literature would almost certainly be crushingly boring. 3. Canon-formation. Another topic I have perhaps thought about too much, but because I mostly read canonical books, books from lists, books written about in other books, it may be worth some time thinking about how they got there. I have a social scientist’s view of the canon. It is an existing thing, or maybe many things, that is or are the outcome of a social process, analogous to how policies are the outcome of a political process or prices of a market economy. Millions of individuals influence the process, some with more heft than others, but no individual or committee or council of clerics determines the outcome. My idea is actually very similar to the argument by D. G. Myers that there is no such thing as the canon (this post is not the one I am thinking of). I assume that this is obvious, but then I see bloggers get tripped up by the word "canon." Blogging is a canon-forming activity. 4. I have a million ideas about how other people are reading and writing incorrectly, and how they should fix their errors and infelicities by doing whatever it is that I do. Somehow, I have been able to keep most of this to myself. Let me continue to do so. If any of these ideas are not as bad as I fear, or if they somehow inspire good thinking, please steal them. I would love to find out why I am wrong. Or right, sure, but I’m not counting on that. Back on June 26th or so. Ubu, etc. Ubu. Ubu. In context, this quotation is a bit of a joke. The narrator of this Javier Marías novel is the one who barely pauses, who spills out words breathlessly, literally, I guess, since he is writing, but the speakers in the novel seem to have the same problem with digressions, qualifiers, and finding a place to end their flow of words. I have trouble imagining the reader who reads this exhausting novel without pause, without many good long restorative pauses. And then I have to consider that this novel is the first of a trilogy, the latter volumes of which may be much like this one in their discursiveness and sly concealments. Many people are in fact reading it right now, as I type, possibly this very instant, as part of a Caravana de Recuerdos readalong opportunity. The plan of many, and of me, too, is to read all three novels this summer, one each month, although they were published years apart from each other, in 2002, 2004 and 2007. Perhaps a wiser reader would allow a little more space between the books. Perhaps a more deliberate pace would allow me to be a better reader of Marías. I say this not because I believe I read the Marías novel badly, although it is a tricky devil, but because I had actually planned to spend this week, or most of it, writing about a really substantial and brilliant book, Henrik Ibsen’s Peer Gynt (1867). Unlike, oh, I don’t know, Life in the Far West by George Frederick Ruxton, Ibsen’s long verse play is enormously complex and obviously worth attentive re-reading. I am reading Ibsen’s book with great pleasure, but I am also reading it badly. Confused, fragmented, distracted, jittery – that’s how I am reading it. When I began Peer Gynt, it was so immediately rich and juicy that I had assumed that a series of posts would suggest themselves. And they have, oh they have – a series of banal posts, any number of tedious and bad ideas. I am not merely reading badly but thinking badly, although I suspect the one is the same as the other. I am taking too long to finish Peer Gynt, I know that – it deserves a bit of breath-holding. But then I look at The Frigate Pallada by Ivan Goncharov (1858), the author of Oblomov. I have been reading this travel book about a Russian diplomatic expedition to Japan for three months, and am not half done. It’s a wonderful book, but it feels entirely natural to slip into it now and again, to follow Goncharov’s account of a day or a week and set it aside. The events of the book covers a couple of years, so I will read about them faster than Goncharov lived them. I feel that I am reading The Frigate Pallada fairly well; I am sure I am reading Peer Gynt badly. Not that I have identified any sort of guideline – books in Category Alpha should be read with Technique Aleph. Nonsense. Books are full of surprises. Peer Gynt surprises me on every page. With luck a second reading will suggest an order to my thoughts, or perhaps another book, or another Ibsen play, will teach me to read it and think about it. The danger of worrying about this issue at all is that it could very well mean the end of book blogs. If I began to think too hard about what I have written here, for example - where’s that Publish button? Where’s that dang – oh, there it is. When I described George Frederick Ruxton’s 1848 fictionalized account of the lives of Rocky Mountain fur trappers, Life in the Far West, as “postmodern” and “my favorite Victorian novel” and so on, I was joking, up to a point, although it in fact does use several techniques associated with postmodern fiction, and is in fact a Victorian novel, however unusual its subject matter. I could also have described it, more credibly, as an application of the methods of Walter Scott, or, for all I know, of Bulwer Lytton, to the place and time that Ruxton knew well and had witnessed for himself. As much as I enjoyed Life in the Far West, the novel left no doubt why it is well-known among historians of the American West and entirely ignored by scholars of English literature. Ruxton’s novel is competent but not complex; memorable for its material but not a strong candidate for re-reading. Layers of meaning will fail to unfold, mostly. But that material, that surface meaning! About two-thirds of the way through the book, the fur trapper protagonists decide, for no clear reason, to become horse thieves, joining a party that plans to raid the herds of the California missions. No, I am wrong, two reasons are clear: the love of pure risk, and an undirected vengeance on Native Americans. The raiders begin in Colorado. It is a long way to California. There are a lot of Indians in between. The most interesting aspect of Life in the Far West is Ruxton’s adoption of the moral perspective of the mountain men, who have themselves adapted the mores of the Rocky Mountain Native Americans. Ruxton’s book is violent, but until this point the trappers and Indians existed in some sort of parity. They squabbled and traded, fought and cooperated. With this episode, though, the book turns into a prefiguration of Cormac McCarthy’s Blood Meridian; the violence becomes concentrated, in purpose if not scale beginning to resemble genocide. My favorite in a quite narrow sense. The book has in fact survived as a historical document. As a novel, it is competent, sometimes just barely; as a description of the manners and methods of the mountain men, it is excellent. The University of Oklahoma Press has kept it in print for sixty years, which is amazing but understandable. The main interest in the mountain men is their reversion from civilization. They voluntarily give up whatever is good and true for a life of freedom and wandering at the cost of hardship, starvation, and a violent and early death. Their motive is only barely economic, since so few of them seem to be able to hang onto any money, or, in their worst moments, any possessions at all. Today’s mountain wanderers are seekers after the sublime, like John Muir. The mountain men may not have had so much interest in knowledge or aesthetics. What they liked was risk. Ruxton understands this point and mostly adopts a point of view that keeps a distance from his characters but adopts, or does not critique, their ethics. Thus, murderous, vengeful expeditions against Native Americans are a part of ordinary life, as is scalping. Cannibalism is terrible because it violates mountain man norms. The purchase of wives is normal, bigamy is normal, marriage via kidnapping is normal. Gambling and drunkenness are super-normal. The novel ends, ludicrously, with the protagonist La Bonté’s return to civilization and marriage to his sweetheart of fifteen years past. La Bonté has already had two (simultaneous) Indian wives and has engaged in all sorts of other non-Victorian behavior. Thus, the novel’s status as my new favorite Victorian novel – it is a wonderful example of a novel that describes, coolly, calmly, all sorts of things that were supposedly off limits, that does things Victorian novels supposedly did not do. It is my new favorite counter-example. Ruxton can describe bigamy, cannibalism, thievery, and murder without batting an eye, but he can’t give the dung beetle it’s name. “Earth,” huh? The author, poor fellow, died of an illness, age 27, just as the serial ended. In a typical postmodern gesture, he appears in the novel, recognizable by his unusual double-barreled English rifle. These scraps were first published, obviously, I hope, in a newspaper column, not exactly filler stories. Traffic accidents, suicides, burglaries, jealous and well-armed wives and husbands, and homicides of all varieties make up most of the items. What else? Strikes, festival queens, the dedication of plaques, anarchist bombs refusing to explode. Many of the entries are entirely banal, most of them are at least historically useful, and a few really do suggest the larger nouvelle that could be written around Fénéon’s words. The art of the form lies not just in the compression of whatever the longer story might have been, but in the little surprises that might pop out of well-chosen phrases or words. If I look back at poor Sergeant Pouget, I see that anyone could have written the first two lines of his story. The last line, though, however ordinary its contents, is phrased so that the tension is raised as high as possible, however briefly, and then shattered. My great puzzle is how to read this book as a book. I have hopped around; I have dutifully read ten pages a day, or five, or two; I have let random words catch my eye. Honestly, I see so point in actually reading the whole thing. I believe I will invoke my resolution not to finish books. I do not quite see the point of insisting on reading every one of these little whatsits. The NYRB edition of Novels in Three Lines is admirable. 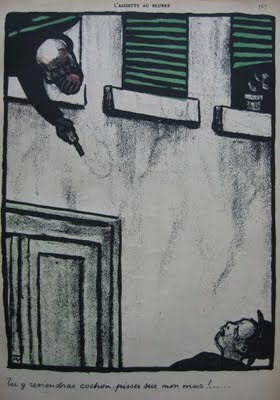 It is interlarded with illustrations – genuine period crime scene photos, newspaper engravings, and a number of prints by the great Félix Vallotton. Please see this fine post at Adventures in the Print Trade, from which I have borrowed the illustration on the left, which is not in the book, but is in the same spirit. 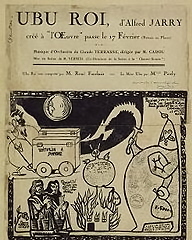 Fénéon was an odd bird, an anarchist and influential publisher, and an associate of Alfred Jarry, which is more or less why I am looking at the book. Luc Santé’s introduction is excellent, plus I know how to read it, word by sentence by page. John Muir’s memoir, The Story of My Boyhood and Youth (1913) is a treat, packed with curious incidents and close observations of nature, but it is a simple book. Muir dictated his history and then fixed it up for publication, and I could tell. It is a charming and instructive book, but not a complex one. I mean, not complexly written. Budding twelve year-old nature lovers could, and should, read it. Same goes for Muir’s most popular work, the 1909 Stickeen, which is only nineteen pages long in the Library of America Nature Writings collection. It describes “the most memorable of all my wild days” (559), when Muir and an adorable dog were caught in a storm while exploring an Alaskan glacier. Again, an all ages story. My First Summer in the Sierra (1911) is a more complex book, as I tried to argue yesterday, multi-purpose, rhetorically complex, artistically varied, surprisingly funny. Do not miss the passage in which Muir describes his greasy fellow shepherd, so “oleaginous” that he involuntarily collects natural specimens, “pine needles, thin flakes and fibres of bark, hair, mica scales… feathers, seed wings, moth and butterfly wings,” all of this adorning his “precious overalls” which “in their stratification have no small geological significance” (227). Muir, even here, is less complex than his intellectual mentor Henry David Thoreau, less imaginative in his metaphors, less endlessly ironic, or, as Thoreau-haters might think, more honest. Muir’s actively worshipful attitude toward nature is his own, not Thoreau’s. What more should I read? The Library of America collection includes an additional 260 pages of essays, plus one more book, The Mountains of California (1894). This book seems to resemble My First Summer in the Sierra in its descriptive and scientific passages, while sacrificing the diaristic narrative. Kevin at Interpolations just wrote about an outstanding fragment of The Mountains of California, a single excellent metaphor, describing a little cluster of ten small lakes as “like eggs in a nest.” Kevin is familiar with the area, and has seen the lakes himself, so the passage has a less abstract meaning to him than to me. Yosemite National Park is, I think, my number one American Humiliation. The Sierra Club has a nice site devoted to their co-founder, including a list of and links to “favorite passages.” I haven’t read any of them! A chapter from Mountains, “The Water-Ouzel,” is “one of the finest animal biographies ever written,” while another chapter describes Muir’s experience of a massive wind-storm from the top of a Douglas fir. John Muir was a lunatic. All right, I should read The Mountains of California someday. Absolutely. Maybe before a visit to Yosemite. What else? If you know, please share. John Muir’s My First Summer in the Sierra (1911) is three books in one. The base of the book is the 1869 journal of Muir’s trip into the Sierra Nevadas as a shepherd, a succession of incidents and adventures – the night the bears discovered his sheep, for example. The incidents are not especially exciting, although they have their moments. Muir is a fine science writer. The question is just how much information a reader wants on heights and diameters, soil conditions, and percentage of cloud cover. It’s all easy enough to skim if too tedious, I guess. Long before this point, I had understood that Muir was only employing the religious metaphors as a piece of his attempt to do something difficult, to accurately describe his genuine spiritual response to the wild, and to give some idea of how his reader can experience the same feeling. Or (now I have thought of book #4) why even a spiritually blighted reader should want to preserve the wilderness, perhaps as a National Park, for those who do have that sort of response. John Muir was born in Scotland. When he was eleven, his father moved the family into the wild Wisconsin forest, which ended Muir’s formal schooling. Instead, “when I was about fifteen or sixteen years of age, I began to grow hungry for real knowledge,” and he became obsessed with reading. This is all from Chapter VII of The Story of My Boyhood and Youth (1913). I did not make that discovery until I was eighteen, or later. Mmm, smack, smack. That’s some gooood poetry. And so on. This is pretty much what we all did when we were fifteen, yes? Working in the fields, or chiseling an eighty foot well from sandstone, from dawn to dusk, going to bed at eight, and then, in the middle of the night, reading Shakespeare and inventing clocks. Yes, pretty much. Like the autobiography of E. O. Wilson (Naturalist, 1994) I read a couple of years ago, the primary task of The Story of My Boyhood and Youth is to give some sense of how John Muir (boy) became John Muir (famous naturalist). And then there is the corollary: why have I not become a famous naturalist? Muir’s memoir (Wilson’s, too) is an admirable success. It decisively answers that question. Page numbers from the Library of America collection of Muir's work, Nature Writings. I will be wandering the prairie for a few days. Back, let's say, Tuesday. Do not forget to contemplate the possibility of reading Anything Ubu. If you are wondering what goes on in Ubu Roi, Jarry's cover from the program for the first performance should help. Let's see, that's Papa Ubu on the right, and I think the little fellows on the left are Polish princes. And then there's a box on wheels, and a burning building, and the moon, and, yes, I have no idea. No idea at all. My question: Has anyone come across theater blogs that are like book blogs, or book blogs that concentrate on plays - meaning, that are not just responding to current performances but are also reading plays, really writing about plays? Anyone reading through Ionesco or Pinter or Calderón de la Barca or whomever? If so, please direct me thither. Thanks. Am I frittering because a good idea is percolating, or am I avoiding the emptiness of my ideas? Prof. Ape boldly claims “that book blogging is no longer principally the purview of rank amateurs (most are at least competent amateurs),” but I do not believe he reads Wuthering Expectations. I guess he did say “principally” and “most,” and our definition of “competent” may differ. He is not Captain Ahab, but wants to be, which is worse. The whale bites off one leg; Brand seeks out the whale not to kill it but to offer another limb. His humanity is allowed to surface, but each time it does, something happens to remind him of the need for sacrifice, for nothing but sacrifice. Perhaps God actually does desire his purging and martyrdom, although for what, now there’s a mystery. There’ll be no mercy shown. Mere lifelong sacrifice! So Brand is a substantial work, ethically complex, poetically invigorating. Geoffrey Hill’s adaptation is a treat, Ibsen’s rhymes replaced by a deft mixture of slant rhymes and alliteration. The “storm \ doom” pair up above is a sample of what Hill does with the entire play. The short lines make the play hurtle forward. I might have read it too fast, gulped without chewing. And I have moved on to Peer Gynt (1867), and want to write about it, not Brand. Just look at these characters: A Voice in the Darkness, An Ugly Brat, The Statue of Memnon (ah ha, this critter reappears in Ubu Cuckolded), Prof. Begriffenfeldt, Ph. D., A Lean Person, The Troll King. I have been trying to sell Ubu Roi as a compendium of crazy, but Peer Gynt is completely insane. And, of course, realistic. Ibsen = realism. Well, as non-writing goes, I have written worse, so I should stop and fritter away my time in some other manner. Vacation preparation, maybe. Are three kinds of Trader Joe’s candy sufficient for a long car trip, or should I bring something more substantial as well, like a box of doughnuts? Ibsen offers no guidance on this question.